A team of doctors and other professionals discuss the best treatment and care for you. They are called a multidisciplinary team (MDT). Some people with localised abdominal mesothelioma can have surgery to try to remove all of the tumour from the abdominal cavity. If you have advanced mesothelioma, you may have surgery to take away as much of the tumour as possible. This type of surgery is called debulking. You may have chemotherapy on its own for advanced abdominal mesothelioma. Or you may have it before or after surgery. Unfortunately, cancer treatments such as chemotherapy and radiotherapy do not always work well for mesothelioma. Doctors and researchers are working to improve mesothelioma treatment all the time. You may be offered treatment as part of a clinical trial. Surgery is not often possible for peritoneal mesothelioma as you need to be very fit for this type of major operation. If surgery is possible, the operation is called a peritonectomy. This means removing part or all of the lining of the abdomen (peritoneum). The aim is to reduce symptoms. If you have early stage peritoneal mesothelioma, you might have chemotherapy directly into the tummy (abdomen). You might have it alongside surgery or soon after if you are fit enough. Unfortunately, peritoneal mesothelioma is often diagnosed when it is quite advanced. Some people may be too ill to cope with intensive chemotherapy. But you can still have treatment to try to relieve symptoms such as pain, weight loss and fluid in the abdomen. This is called palliative care. It’s managed by a team of doctors and nurses who are experts in controlling symptoms of advanced cancer. The team may also include a physiotherapist and dietician. 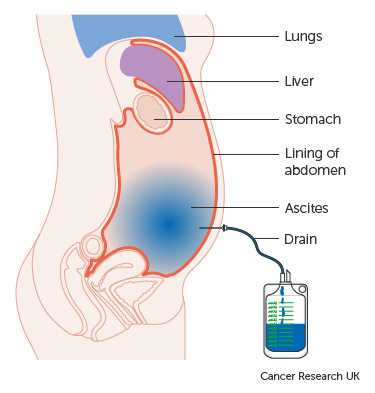 With peritoneal mesothelioma, fluid may collect inside your abdomen (this is called ascites). If too much fluid collects, it makes your abdomen swell. This can be uncomfortable and heavy. You can have this fluid drained off. This treatment is called abdominal paracentesis or an ascitic tap. Your doctor might ask if you’d like to take part in a clinical trial. Doctors and researchers do trials to make existing treatments better and develop new treatments. Canadian Journal of Surgery. 2009 February;52(1):59-64. Cancer Treatment Reviews. 2012 June;38(4):258-68.